With music by Richard Cocciante and lyrics by Luc Plamondon. The show, based on Victor Hugo’s 1831 novel of the same name, has played once before in the West End, in 2000. It will return ahead of the 20th anniversary of the original French production, which falls in September. 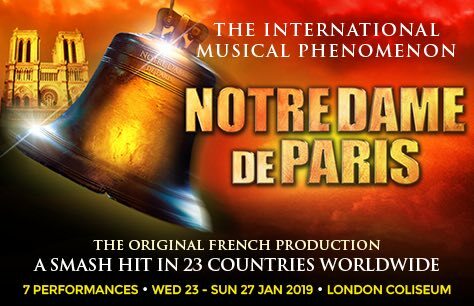 It runs at the Coliseum for seven performances from January 23 to 27, 2019, and will be performed in French with English surtitles. Please note this is the original French production, sung in French, and will be performed with English surtitles. With my sister and me from the Netherlands to London to see this musical live. We both have dvd and watch this already many times. We loved to see everything and we believe we will speak about this for long time. Beautiful theatre and complete performance was were we hoped for to see. Thanks for this opportunity. Henriette and Willeke from the Netherlands. This musical is one of the bests I've ever seen! The actors are fab, music is great and you enjoy every second of the musical. I strongly recommend this!